Show Racism the Red Card worked in partnership with long-standing supporters Plymouth Argyle FC Community Trust and Plymouth City Council to run an educational event for young people from local schools at Home Park. Year 7,8 and 9 pupils from Coombe Deane Secondary School and Year 5&6 pupils from Cathedral School of St Mary spent the morning taking part in workshops with activities that explored racism, stereotypes and where they come from. They were also able to take part in a tour of Argyle’s stadium and see behind the scenes at the League 2 leaders. In the afternoon, all participants gathered to see a screening of the Show Racism the Red Card film and then take part in a Question and Answer session about racism with panellists including Plymouth Argyle FC players, Jordan Slew and Ryan Brunt, Plymouth Argyle Ladies FC, Amarnie Jean, Sgt Paul Laity from Devon Police Diverse Communities Team and Heather Ogburn, Chair of Diversity Forum and PREVENT lead at Plymouth City Council. Leon – Why does Racism happen? Ellie – How do you think we can stop racism and be kinder to each other? Michael – Have you ever been targeted by, or witnessed racism? 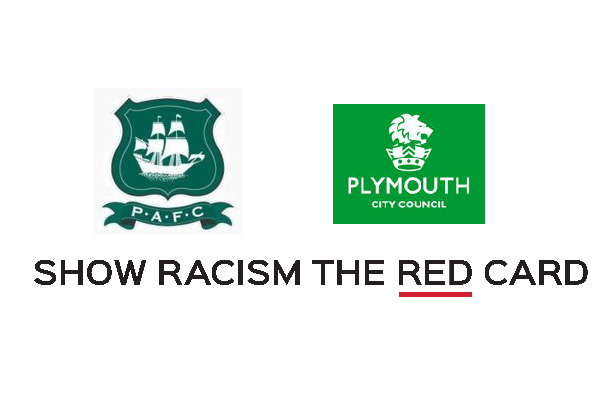 Show Racism the Red Card would like to thank Plymouth Argyle FC and Plymouth City Council for their ongoing support. This year’s event was very good and the young people in attendance really engaged with the workshops and the Question and Answer session. We look forward to the next event in Plymouth.